Recover Adobe PDF, Microsoft Office and OpenOffice documents from all types of storage media. Algorithms from Magic\'s flagship ensure reliable recovery from repartitioned hard drives, formatted partitions, corrupted and inaccessible disks. Recover Adobe PDF files, Microsoft Office documents and OpenOffice ODS and ODT files from healthy, formatted, corrupted and inaccessible storage media. 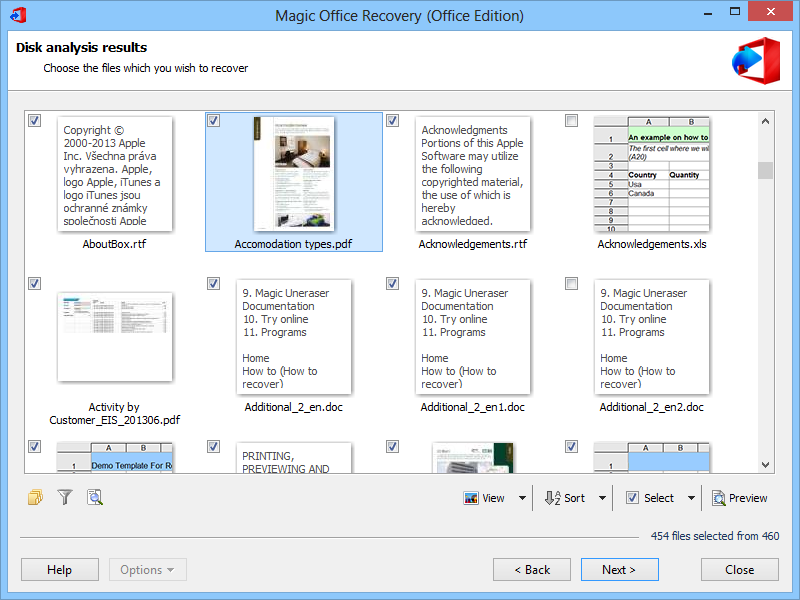 Magic Office Recovery uses a set of highly advanced data recovery algorithms from Magic\'s partition recovery tool, ensuring that the documents can be reliably recovered from repartitioned hard drives, formatted partitions, corrupted and inaccessible disks. Try MDF File Viewer in order to view or open SQL database MDF files effortlessly. It has the capability to restore database objects like tables, views, keys, triggers, etc. Admirable XLS to PST converter tool is a perfect Excel spread sheet converter tool it easily convert Excel to Outlook contacts. Our XLS to Outlook tool also allows you to convert .CSV files to Outlook contacts. Invisible Files 2000 Pro is the program for Windows 9x/ME that allows to hide any file or folder on the local hard drives of personal computers. The files are not physically deleted but they are invisible (even in Windows safe mode or DOS session).